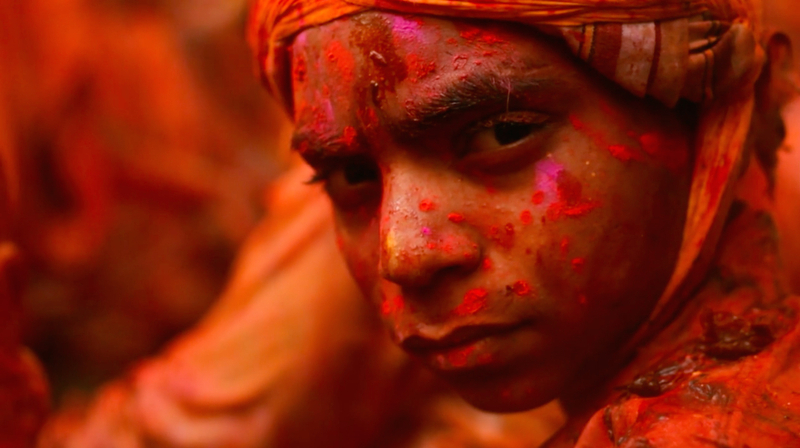 Two men, each armed with a DSLR camera and two assistants, dove headfirst into the crowded streets, frenzied rituals and unbridled passion of Holi, the ancient Hindu religious festival held over eight days in the Spring throughout India. These adventurous filmmakers were Prashant Bhargava—director of 2011’s superb “Patang,” which staged a family drama amidst India’s largest kite festival—and Craig Marsden, an accomplished cinematographer who served as an assistant film editor on Harmony Korine’s 1997 directorial debut, “Gummo.” Their goal was to capture footage for a short film that would eventually become the visually dazzling 35-minute opus, “Radhe Radhe: Rites of Holi,” which is scheduled to screen with a live orchestra at various venues around the country over the next two months. Indie Outlook spoke with Bhargava and Marsden about the project’s fascinating evolution, the mind-boggling obstacles they faced and their collaboration with composer Vijay Iyer. Full disclosure: I was a creative consultant on the project and assisted Bhargava during a portion of the extensive editing process. Prashant Bhargava (PB): It was originally commissioned by Carolina Performing Arts as part of a series commemorating the 100th anniversary of Igor Stravinsky’s composition, “The Rite of Spring.” There were a number of fantastic artists who were also a part of the series, such as Yo-Yo Ma, the Martha Graham Dance Company and Bill T. Jones. The group had contacted Vijay Iyer, who’s a MacArthur genius and a Grammy-nominated musician, and he reached out to me. His inclination was to explore a Hindu or Indian Rite of Spring. He’s always been exposed to Stravinsky’s work and was not as keen on exploring it in the traditional way. He felt that it had been done many times before and it was important to take a different approach. So he had the idea of focusing on Holi, which is a joyous celebration normally characterized by people throwing color at one another. He suggested that we could shoot the celebrations in Queens but I wanted to explore where the festival had originated. The festival was going to happen in three weeks, so it was quite a rush. I knew Craig through some other work and I needed someone who would be able to just roll with it while maintaining a strong aesthetic. Craig Marsden (CM): I have shot some documentary work, including a couple of films that were on PBS, “Las Marthas” and “We Still Live Here: Âs Nutayuneân” by Anne Makepeace. That film was about indigenous identity issues, so there was some crossover there with this project. I’ve also shot footage of a dance company, so I’ve had experience capturing music and performance. I was totally fascinated by rituals and improvisation and culture and the way these things blend together, but I was not prepared for what we were getting into. I had never been to India before. One thing that Prashant and I had in common was the ability to work on our own. Prashant has the sensibility to go out there and be very self-reliant and super-alert. When we got to [the town of] Mathura, there was so much going on and way too many things to look at. As a defensive reaction, you want to just start filming everything, but Prashant said, “Sit here for an hour and just watch and observe.” That was the advice Prashant had given his actors in “Patang,” and it really helped me contend with the onrush of stimulation. What was your starting point, in terms of preparation? PB: The first task was to get to know The Rite of Spring. That literally began with reading the Wikipedia entry and then going from there and starting to do more research. I didn’t understand the piece at first. It sounded very eerie, and it has a lot of dissonance. It wasn’t something that was warm and inviting, but it grew on me and I fell in love with it. CM: You became obsessed with it and got deep into the structure of it. PB: We were well aware of that structure when we reached Mathura. Craig and I had listened to the composition’s twelve movements several times and tried to imagine what that climactic twelfth movement would be. My first thought was to do an exploration of the Radha Krishna myth, since I didn’t see a connection between the color and laughter of Holi and the darker undertones and stronger narrative arc of The Rite of Spring. When we arrived in India, I found the level of fanaticism and feverish devotion initially unsettling, and I’m saying that from a perspective of believing myself. I was also apprehensive because I am accustomed to having a much longer period of research prior to filming. With “Patang,” I had three years. I wanted to make something that people from the area would feel very proud of. What we discovered while editing was that this is not a documentary. This is not meant to be a piece that is describing what happens each day during the festival. It is motivated by the objectives and arc of The Rite of Spring. In section one, the city is waking up. You can take any shot and incorporate it as long as it creates the sensation of waking up. Section two is the act of preparation. That may be someone in a sweet shop rolling out some dough or drying themselves off with a towel. We found the objectives within each movement, and in our first cut, the objectives were those of the devotees. This past April, we did a second shoot where we had an actress, Anna George, portray the goddess, Radha. CM: You always knew what bit you needed and were very particular in what you were looking for. It was not a random collection, there really was a solid structure behind it. I got to come in for the editing and it was amazing because you knew the material intensely well. Your approach was not associative, it required very rigorous thinking about what was needed at any particular point. PB: It was beautiful to discover the arc of the Stravinsky piece in Mathura. [The Lord] Krishna was born in that region and his initial flirtation with Radha occurred there. There are several interpretations, but consistent in all is that Radha was a married woman. In my interpretation, Radha is twelve years older and introduces Krishna to his own sexuality. I examined the arc within each movement of The Rite of Spring and found parallels within the footage. For example, the procession of devotees into the temple occurs during movement six, Procession of the Wise Elder. It was also important that Craig and I recognized what our strengths and differences were in how we shot. We would split up. CM: You were crazier. [laughs] At various points, we would get separated and lose contact with one another. PB: I enjoyed being completely irreverent and jumping into madness. It’s an event heavily covered by photographers, so the people there are pretty open. It was crucial that I wasn’t approaching it from the perspective of someone trying to carve away or break down the institution of religion or find the sensationalism. I was coming from a place of belief and a genuine sense of love. At the same time, I was obnoxious. If there was a dancing pit, which is very similar to a mosh pit in the type of violence that occurs within it, I would go right in the middle. Now that’s stupid. PB: We got pretty beat up. We both had days where we couldn’t go out. I got a cut on my foot that got inflamed. The cameras were small and had rain covers on them, and I would just challenge people to throw everything at me, and they would. I engaged in the same cathartic dancing and wildness of the people I was filming. That would not have happened if I didn’t have the “Patang” experience. The beauty of the environment is preserved and the magic that’s occurring is not effected by your presence. 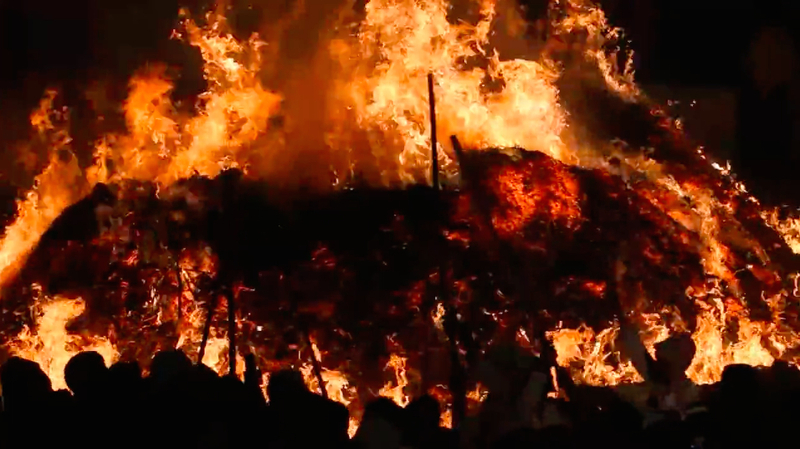 One of the most interesting things we encountered was the bonfire, which is an odd ritual for Holi. It took place in a relatively small square with low-hanging telephone and electrical wires. At one point, I got surrounded by policemen asking what I was doing there. I just started explaining everything. That was one thing I learned from “Patang”: don’t just tell them the whole truth, tell them so much truth that they don’t want to hear any more. One of the cops asked, “What do you think the Americans will think of this?” I said, “Well, half of them will think that you’re pretty crazy. The other half are going to look at these rituals that you are engaging in and see themselves in a different light. You will open them up to entirely new possibilities. This will be a gift to them.” Then the cops asked, “Where do you want to shoot?” and allowed me to get up close to the fire. CM: Nobody could be down where he was! The flames were so hot that everyone reared back when they flared up. I don’t know how he managed to film it from such a close distance. Prashant was always in the center of the ring. I was always scrubbing the lenses for days afterward. [laughs] Early on in the shoot, my glasses got snatched by a monkey outside of the temple, so for two days, I couldn’t see except through the viewfinder of the camera. PB: Monkeys do that all the time. They take your glasses and demand biscuits. Then they’ll throw them back and often get broken in the end. Did you ever get scared? PB: Only one time. That’s when I shot the footage of the red powder and the small boy looked into the camera. I sat down in the first row alongside the other devotees, and they didn’t like that. They didn’t mind it, but I think they were surprised that a photographer or someone with a camera who’s not from their village would sit there, since this is a ritual between two villages. The liquid in the temple was an inch and a half deep and you have to go in barefoot. The crowds and the amount of pushing was very scary. I swung around my camera at one point to avoid shooting the deities, which is not allowed, and then someone hit me really, really hard. The powder made me unable to see anything and I didn’t know what I was filming. That’s when the sense of claustrophobia set in. I ended up getting so soaked in the red liquid that three months after the shoot, I had red toenails. Since you cut the footage to The Rite of Spring, when did Vijay Iyer’s music come into play? PB: I would like to do another project with Vijay where we are both engaged in each other’s craft throughout. This particular project was not like that. We basically had overlap in the times that we exchanged our work. I showed him footage and got his input, but I didn’t know how to work with his recordings, which were not with the full orchestra. They were digital explorations of rhythm and instrumentation and I wasn’t able to imagine how amazing they would eventually become. I gave Vijay my cut of the film and he watched it without listening to the Stravinsky music. Then he composed his original score. The inherent structure and rhythm of The Rite of Spring was preserved while at the same time, there was enough flexibility for Vijay to embrace it and have a great deal of freedom to explore in his own way. He did a marvelous job. The film is split into two halves, Adoration and Transcendence. What inspired you to add the footage of Radha after the initial premiere in March 2013? CM: The title, “Radhe Radhe,” is a Hindu greeting that ties into the recurring theme of summoning Radha. There was a sense that she had to be personified and humanized to a degree. The principle beat is that she’s waiting for the arrival of her lover. Then there’s people at the unfolding celebration who are summoning her, so there’s this sense of a parallel between the crowd and her. One seems to bring about the other. With Radha, Prashant and I were really trying to explore, in a very micro way, a shift from one thought to the next. 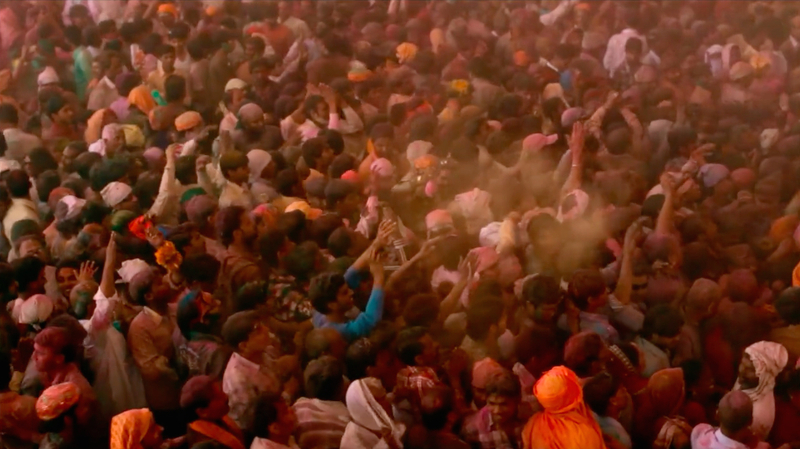 Anna George in Prashant Bhargava’s “Radhe Radhe: Rites of Holi.” Courtesy of Khushi Films. PB: The first section is the call/response of the devotees. As they wake, Radha wakes. As they call, she’s awakened and gets ready. As they rush toward her, she stands and watches them from above. As they grow closer, her smile encourages them to move up further. The second half is about Radha’s relationship with Krishna, and it’s unclear whether Krishna is physically present or if he’s a memory. The Radha Krishna myth is usually about their pursuit of one another and they are rarely seen together. In our film, you see Radha in her private bedroom, waiting for him to come. Then there’s some doubt that he’s not coming and a deeper frustration that he may be with someone else. Then she’s swept away by feelings of sweetness as she remembers their encounters. As the fire is burning, the memories reach their climax. It was really fun to shoot the scenes of the goddess, and my depiction of her was partly influenced by “Under the Skin.” Craig was co-directing the scenes with me, and it was fun to take that immense leap of faith. It was static, staged, acted footage shot on a completely different stock, nothing like what was in the film. The eleventh and twelfth movements became very confusing. The length of the shots were one or two seconds and the static shots of Radha had to be part of that fabric, so I had to rip apart the piece in order for it to work. At the same time, I was falling in love with Vijay’s music and finding something entirely different within that. It is our hope that the film enables audiences to feel the same ecstasy, primal joy, celebration and cathartic release that we experienced along with the devotees in the process of making it. “Radhe Radhe: The Rites of Holi” screens with a live orchestra Thursday, November 6th, at Music Center at Strathmore in Maryland; Saturday, November 8th & Sunday, November 9th at OZ in Nashville; Friday, December 5th, at Royce Hall in Los Angeles; and Thursday, December 18th through Saturday, December 20th at BAM Harvey Theater in New York City. The film also screens November 9th at the San Francisco International South Asian Film Festival. Vijay Iyer’s “Radhe Radhe” soundtrack will be released on Amazon Tuesday, November 4th, and the film’s Blu-ray and DVD will be available Monday, November 17th. For more information, visit the film’s official Facebook page.